As GluteGuard users would already know, GluteGuard utilises the wonders of the papaya to detoxify inadvertently ingested gluten peptides that somehow find their way to the gut. This unique, patented enzyme action involves the highly specific enzyme called Caricain, found in the skin of the unripe Carica Papaya fruit. The enzyme, combined with the right technology to protect it from the acidity of the stomach, is delivered to the small intestine where the very specific toxic fractions of gluten are broken down. With a long history of being utilised for traditional medicine, papaya is a rich source of powerful antioxidants, enzymes and vitamins. The papaya is a nutraceutical plant with a wide range of pharmacological activities. Also known as Carica papaya, there are two main papaya varieties- Mexican and Hawaiian- within the genus Carica of the family Caricaceae. During the past few decades, a considerable amount of research has been done to illuminate the biological activity and medicinal applications of papaya. 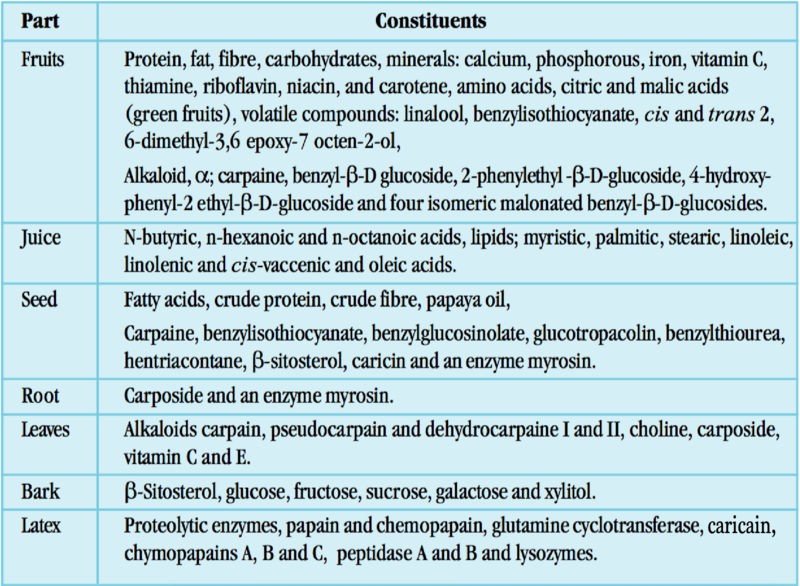 The table below summarises the chemical composition of papaya. 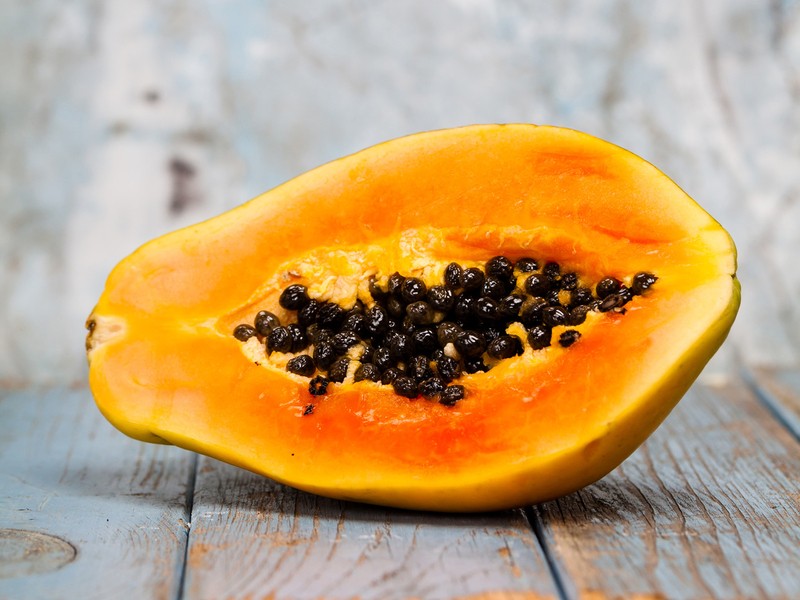 The seeds and leaves of papaya have a number of benefits, including the normalisation of clotting, the increase of white blood cell and platelet production, antibacterial properties and protection of the kidneys- papaya seeds can even be ground up and used instead of black pepper! The fruit of the papaya itself is a rich source of vitamins and nutrients such as provitamin A, carotenoids, vitamin C, vitamin B and lycopene, and contains enzymes that facilitate digestive regularity. The latex from unripe papaya fruit contains four cysteine endopeptidases, or enzymes- papain, chymopapain, glycylendopeptidase and caricain. Recent research has revealed just how powerful these enzymes are; caricain, as a component of GluteGuard, has been shown to be a great extra layer of protection against inadvertent gluten consumption. It is easy to see why papaya is not only an excellent addition to your diet, but also a valuable contributor to pharmaceutical and enzyme supplement products! Yogiraj, V, Goyal, P, Singh Chauhan, C, Goyal, A, Vyas, Bhupendra 2014, ‘Carica papaya Linn: An Overview’, International Journal of Herbal Medicine, 2(5), pp.1-8. Krishna, K, Paridhavi, M, Patel, J 2008, ‘Review on nutritional, medicinal and pharmaceutical properties of Papaya (carica papaya Linn. )’, Natural Product Radiance, 7(4), pp.364-373. Aravind, G, Bhowmik, D, Duraviel, S, Harish, G 2013, ‘Traditional and Medicinal Uses of Carica Papaya, Journal of Medicinal Plants Studies, 1(1), pp.7-15.